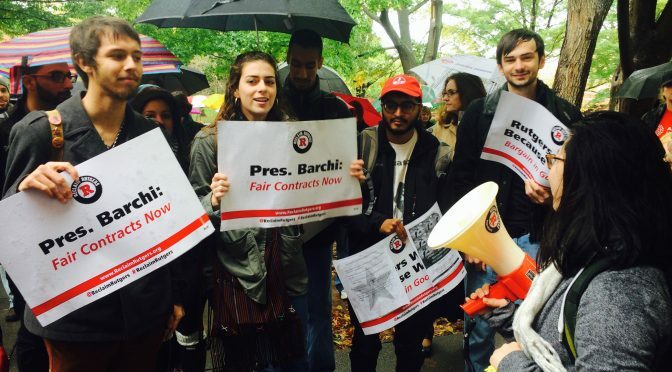 Whether you add your own words or just submit the pre‐written letter, you are showing your support for a fair contract and workers’ rights by signing the petition to President Barchi. I have been an employee of this University since June 1989 in one capacity or another, an hourly worker prior to beginning my studies, “Type 5/Class 5” student worker until my graduation in 1993, and a full‐time employee since October 1993. ALL Rutgers workers deserve better. Stop the attack on workers’ rights and collective bargaining and negotiate a fair contract. Whether today’s omission of dues deductions was intentional or truly an accident, it is sending a poor message to all. As a member of the University, we would like to ask that you have an open mind at the table regarding our contract. We are committed to serving our students and families with the utmost integrity and respect. With scarce resources to perform our jobs (system challenges), we are still committed to perform professional and quality work. As the cost of living rises, so should our income. Some of us are making little to nothing and a decent raise would help feed our families. I would hope that you value your employees from all walks of life at every capacity. Please negotiate a fair contract, soon. As a college graduate, wife, mom, millennial, and woman of integrity who has been a full time staff member of Rutgers Newark for 1 year, I see the good that Rutgers can do. Its workers are the ones who fuel its success. Please urge your management colleagues to work with us to have a fair contract! I signed up to be a full member of the URA. It was brought to my attention that some members noticed their dues were not taken out of their paycheck this week. I looked at my paycheck and saw the same happened to me. I am a full member by choice. Why would you keep my dues from the union? It makes the University seem very untrustworthy to act in this manner. Shame on Rutgers. Respect workers’ rights! If you truly want Rutgers to be a better place, you will invest in your personnel. I need Rutgers to negotiate with my union. I need a raise — I work hard and support RU in a variety of ways. But my salary has been going backwards in terms of “real” wages. I’m worse off today than I was when I started here 20 years ago. Why do we have SO many administrators at the top making SO much money, but there is nothing left for those at the bottom who are ACTUALLY DOING THE WORK to make those administrators look good? We need fair increases now. The old slogan is truer now than ever: Rutgers works because we do! With all the craziness of Cornerstone and the continued attacks on education by the current GOP administration in Washington, it’s so important that Rutgers supports its administrators. Doing our jobs well means that professors can focus on their research and teaching, and students can focus on their educations rather than being frustrated by poorly managed offices and trying to make up for what is lacking there. Administration is what makes university education and research possible. As a PhD recipient myself, I’ve seen both sides, and I can tell you that a disgruntled workforce hampers the work of education severely. Many many old hands are retiring due to the lack of support from on high, and taking a wealth of institutional knowledge with them. Please support your administrators! As a former Rutgers employee and Union Executive Board member and Steward, I support the Union of Rutgers Administrators. I fully support the URA. If not now, when, President Barchi? Rutgers has benefited from good economic conditions. Presumably there will be leaner times as well. How will you plausibly argue that the university has fallen on hard times that require sacrifice if you never acknowledge better times? I know that I have benefited from the union. I will never forget that in the previous contract, your opening offer was … $0.00. Nothing. Thankfully, we had a union. Listen to and have respect for the people who do necessary work across every division of the University. Dr. Barchi, be an example of respectful and compassionate leadership for Rutgers workers who, like everyone, are working to pay bills and take care of families. Stop the attack on workers’ rights and collective bargaining and negotiate with our unions in a judicious manner so workers can have a fair contract. Stop using Janus v. AFSCME as a tool to bust all Rutgers unions and take away our hard‐earned rights. Strong, respected unions are critical to past, present, and future protection of workers’ rights. We are doing our part in coming to the table to negotiate in good faith so members receive fair compensation for the State of New Jersey, health insurance that takes into account we are in the highest tax state in the country and secure retirement benefits that won’t require moving out of New Jersey upon retirement further contributing to the exodus.